I discovered this first book of six in The Cousins’ War series Googling what to read while waiting for George R. R. Martin to complete the next instalment in The Game of Thrones series. Recommended on this list by Vox, I feel like The White Queen is much more a historical novel than a fantasy novel. True, Elizabeth Woodville — descendant of water goddess Melusina — can cast spells to control weather and injure her foes, though this magical element is a tiny part of the book. 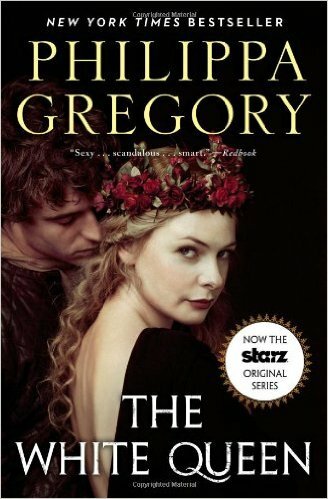 The White Queen tells Elizabeth’s Woodville’s story: an unlikely widow marries a king in secret and, after the secret wedding is revealed, various factions in England play tug-of-war with the throne for the following 300 pages. The allegiances dissolve and reform so fast that you need a pen and paper to keep tally. I learned early on in reading this book not to count on any loyalty from anyone and found this the most disappointing aspect of the book. There are few — if any — characters to root for. To say the Plantagenets, the Yorks, and the Tudors lacked imagination in naming their children is an understatement. There are so many Edwards, Richards, Elizabeths, Henrys, and Georges that you need an org chart and an alive/dead/in exile scorecard to keep track of who is who and where they are. There are five more books in this series, covering different real-life players in a true life 15th Century England game of thrones, though they’re not for me.